MK suspected of accepting forbidden donations, not reporting the donation and handing in a false declaration, in 2013 labor party primaries. MK Yitzhak Herzog was questioned under caution by police on Sunday, in accordance with the approval of the Attorney General. Herzog is suspected of accepting forbidden donations, not reporting the donation and handing in a false declaration, all in connection with the 2013 labor party primaries. "The leader of the Opposition and chairman of the Zionist Camp Yitzchag Herzog arrived this morning to give his testimony at the request of law enforcement agents. Once reports of the investigation were leaked, police asked Herzog to give his testimony, and he agreed in order to put the whole matter behind him. Herzog has full confidence in the enforcement agencies and is grateful for the honorable and decent conduct,” read a statement from Herzog’s office. 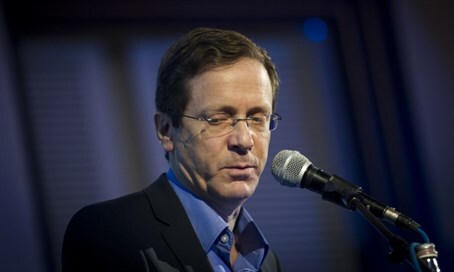 While many members of his Zionist Union faction - comprising of the Labor and Hatnua parties - back their leaders, some MKs have begun to voice concern over the potential harm the ongoing corruption saga could have on the leading opposition party. "We are a serious and sensible party, every person that is called in for questioning has the right to say what is in their heart and answer to their best ability. We all agree we should not jump to a ‘kangaroo court’ and I tell you now that if that happens I will bring it to the summit. I am confident in myself and I will continue to lead with honesty and integrity as they were always my guiding light," said Herzog.